Daniel performed on show 347, recorded in October 2017, at age 17. 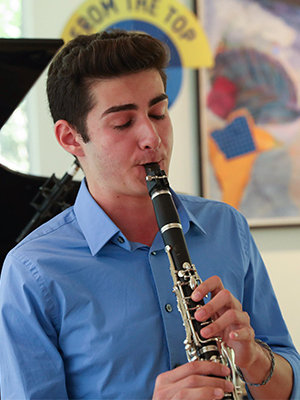 Daniel Solowey (clarinet), 16, hails from Sarasota, Florida and attends the Interlochen Arts Academy in Michigan. He has been awarded From the Top’s Jack Kent Cooke Young Artist Award. He has studied with Bharat Chandra, Principal Clarinet of the Sarasota Orchestra and Dr. Bryan Conger at Interlochen. Daniel’s most memorable musical experience was this past summer, when he attended Boston University Tanglewood Institute for six weeks. There, he played in the Young Artists Orchestra, with a program of Tchaikovsky’s Fifth Symphony and the Lutoslawski Concerto for Orchestra. Aside from music, Daniel also has a passion for photography and art.